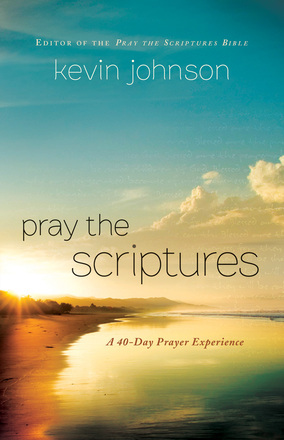 Author Kevin Johnson is the creator of the "Pray the Scriptures Bible." His new book, "Pray the Scriptures - A 40 Day Prayer Experience," is the next step to that Bible, although you don't need to have the Bible in order to read/use the book. According to the introduction, the book helps to "build your own habit of praying Scriptures by leading you to respond to forty daily Bible readings." Each "day" has an opening thought, a passage of Scripture broken up with prompts to use in learning to pray the Scriptures back to God, and questions to answer for reflection. (1) This book wasn't one that sparked a huge interest in me, but maybe it would have been better if I were doing it in a group setting rather than on my own. While it CAN be used on your own, doing it with others may help give the accountability needed to truly reflect on each passage. (2) The author uses several different versions/translations of the Bible throughout the book. While I'm not a one-version-only type of person, there are some versions I do not recommend for study purposes (i.e. The Message) because they actually take away from or add to the original meaning of the Scriptures. I suggest using and comparing your preferred Bible translation (NIV, NASB, KJV, NKJV, etc) with what is written in the book. (3) This is not a book meant to just sit down and read. It is interactive and requires some thought from you. This is good, as it helps bring out more meaning of the Scriptures, and it can help you work through issues such as forgiveness, trials, loneliness, the love of God, contentment, service, etc.